This is a comprehensive reference guide that focuses on behaviors and interactions of young children. It is designed to assist adults who care for children and includes recommended strategies to provide optimal learning environments and experiences. 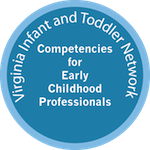 This publication is intended to improve the quality of early childhood programs by clearly identifying the skills and knowledge needed by adults who are supporting the growth and development of children from birth to kindergarten. 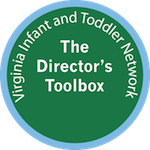 This publication is designed to assist directors in meeting the standards for Licensed Child Day Centers. It also guides directors and new staff members through the process of orientation. Included is a wide variety of recommended and required sample and model forms. 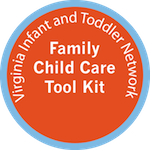 This resource contains guides and outlines, sample policies and procedures, forms and checklists, information on child development, health and safety, and is designed to assist family child care providers in promoting quality care and education for children they serve. 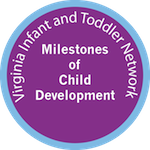 "The VA Infant & Toddler Specialist Network affords us the opportunity to put new ideas and practices into place to help us become better at what we do and the care we provide."